Strong colours and strong lines create a powerful impression of the awe-inspiring nature of the mountains of Snowdonia. 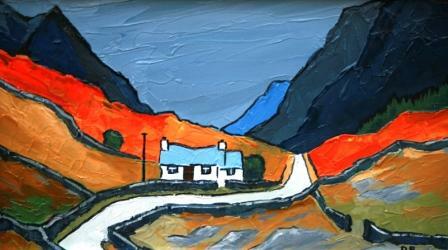 The dramatic scenery of this area of north Wales has inspired much of David Barnes art work. His paintings are influenced by Welsh artists Sir Kyffin Williams, Gwilym Prichard and Wynne Jenkins. David Barnes paintings are highly textural. He uses a palette knife, painting in oils and using a thick impasto technique to produce bold strokes that add strength and texture to his paintings, giving it a sculptured feel and create further contrasts and interest.